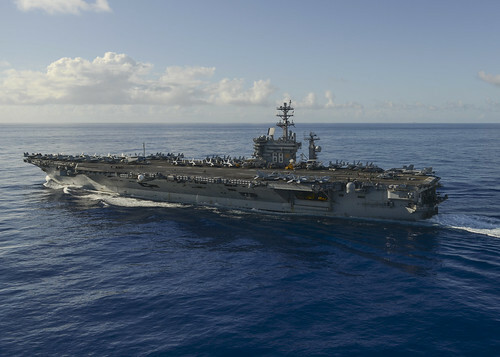 PACIFIC OCEAN - The Nimitz Strike Group, consisting of the aircraft carrier USS Nimitz (CVN 68) with embarked Carrier Air Wing (CVW) 11, Carrier Strike Group (CSG) 11 and Destroyer Squadron (DESRON) 9 arrived in the U.S. 7th Fleet area of operations, June 21. While operating on patrol in 7th Fleet, Nimitz is slated to enhance maritime partnerships and promote peace and stability in the Indo-Asia-Pacific region. The U.S. 7th Fleet area of operations spans 48 million square miles from the International Date Line to the Western Indian Ocean. CVW 11 includes the “Argonauts” of Strike Fighter Squadron (VFA) 147, the “Black Knights” of VFA 154, the “Blue Diamonds” of (VFA) 146, the “Death Rattlers” of Marine Fighter Attack Squadron (VMFA) 323, the “Gray Wolves” of Electronic Attack Squadron (VAQ) 142, the “Blue Tails” of Carrier Airborne Early Warning Squadron (VAW) 121, the “Eightballers” of Helicopter Sea Combat Squadron (HSC) 8, the “Wolfpack” of Helicopter Maritime Strike Squadron (HSM) 75 and the “Providers” of Fleet Logistics Support Squadron (VRC) 30. The deploying units from DESRON 9 accompanying Nimitz are the Arleigh Burke-class guided-missile destroyers USS Howard (DDG 83), USS Shoup (DDG 86), USS Pinckney (DDG 91), USS Kidd (DDG 100), and the Ticonderoga-class guided-missile cruiser USS Princeton (CG 59). Nimitz left its homeport of Bremerton, Wash., June 1. The ship joined with the aircraft of Carrier Air Wing (CVW) 11 and the ships from DESRON 9 June 5 and stepped through their final phases of training before arriving in 7th Fleet. Nimitz’ last cruise to the Western Pacific was in 2013. Nimitz Strike Group follows in the wake of countless ships, aircraft, Sailors and Marines that have deployed over the past 70 years, continuing the Navy’s ongoing commitment to maintain security and stability in the Indo-Asia-Pacific region.